There’s always black or black stainless, but paired with white cabinets – which is the most popular cabinetry color with white counters accounting for about a third of counters in new kitchens – black appliances may be more of a dramatic contrast than some people want. What’s the alternative? How about white appliances? I’m not talking about the ones we used to know. Or even the ones that have made a resurgence in recent years. 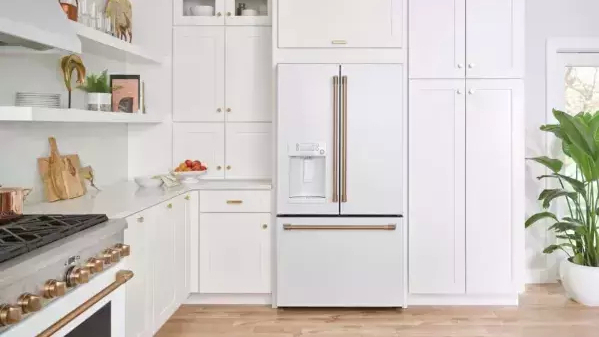 I’m talking about the new GE Café series: sophisticated, commercial looking appliances with customizable details that will give your kitchen a high end look without breaking the bank. And they’re available in a beautiful matte white finish. They're also available in matte black or stainless. What makes these appliances unique is that the hardware is available in four finishes – brushed bronze, brushed copper, brushed black or brushed stainless - so that you can create just the look you want.